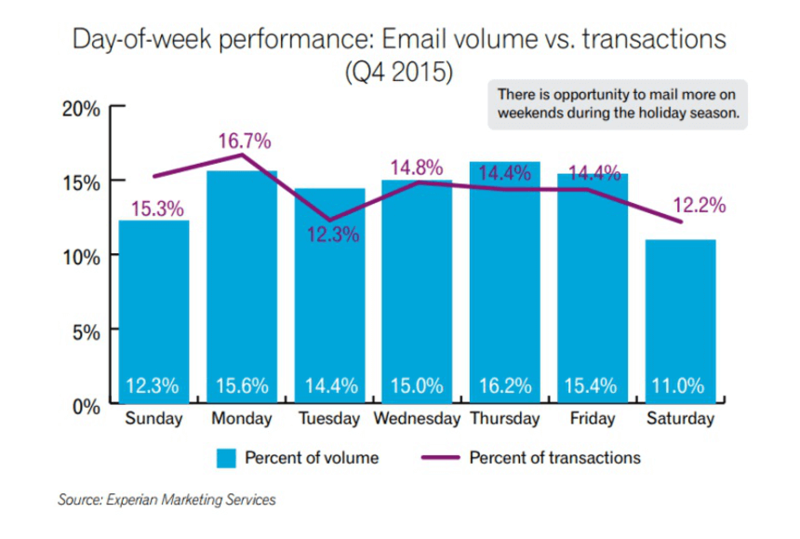 Why Should You Send Marketing Emails on Weekends? If you compare the actual number of transactions to the volume of the emails on any given day you can get a clearer picture. If email volume is high but transaction numbers are relatively low, you shouldn’t increase the number of mails. **Focus on improving quality instead! **create better copy, spend more time with your email builder and design responsive templates. Don’t stick to one design all the time, you can easily create different versions and A/B test them, but don’t change everything in your templates, just one thing at a time. Improve the email template itself, don’t flood people with more emails! But if the number of transactions is are relatively high compared to email volume, there is a potential opportunity for you to convert more people those days. The high transaction number shows that people are willing to convert, but on weekends email marketers tend to send out fewer campaigns. The report says that Saturdays and Sundays are exactly the time for you to reach out. Of course in order to be successful you have to craft your email (copy and template, subject line and design) perfectly. If you don’t do that, you will just annoy your recipients. But if you spend enough time with preparation, email design and your responsive email editor, you could be the “one” who can get them to convert even on a sleepy Sunday. 2015 saw a huge spike in the overall volume of emails sent (23.4%) – email is stronger than ever. Email marketing is not only the online marketing channel with the highest ROI, but increasing transaction rates by 14% and revenue by 12.8% respectively during last year. Did you manage to grab a piece of that ever growing cake? If not, maybe you should consider getting through to your prospects on the weekends. Check out our Email Marketing Strategy Guide and learn more about the depths of email marketing!